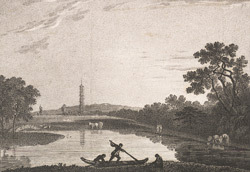 View from the lake of Kew Gardens, looking towards the Pagoda. Kew's foundation as a botanical garden was begun in the 18th century by Princess Augusta, mother of George III. The pagoda was built as a surprise for the princess, following an 18th-century fashion for garden ornaments in the Chinoiserie style. It was completed in 1762, to a design by Sir William Chambers, and remains a landmark, being almost 50 metres high.